Aspen Pet Tieout X-Large 20′ give dogs the freedom they crave while keeping them safe and out of trouble in the absence of a fence. Super strong, galvanized aircraft cable, coated with crack-resistant vinyl. 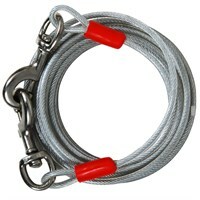 Great for dog owners who don’t have a fenced-in yard, this galvanized steel cable is available in a variety of sizes to hold different sized dogs. Cable is made of a strong vinyl coated, steel aircraft cable that is crack resistant. Containment products are utilized for restraining your pet while outdoors. Tie out cables, chains, trolleys & stakes are easy to install, clean & store. All cable, chain & trolleys should withstand up to 7x the weight of the dog.